cyclic compounds with thiazol rings and peptide bonds (Fig. 10.11). The antibiotics inhibit the binding of EF-G:GTP, as well as EF-Tu:GTP, to the large subunit of the bacterial ribosome. They interact with the ribosome in the region of the base of the L7/L12 stalk, i.e. in approximately the same region where binding of EF-G (and EF-Tu) has been demonstrated (see Section 9.4). Protein L11 and its rRNA site, that is the three-way helical structure shown in Fig. 9.10 B (the so-called "GTPase region), are responsible directly for thiostrepton binding. Thiostrepton protects from chemical modifications two hairpins, at positions 1057-1083 and 1087-1102 (Fig. 9.10 B). It is remarkable that some thiostrepton-resistant mutants and strains are devoid of protein L11 as a component of the 50S ribosomal subunit. Specific enzymatic methylation of A1067 also confers the resistance against the antibiotic and abolishes the affinity of the ribosome to it. The antibiotic directly protects A1067 from chemical modification and covers protein L11 upon binding. The thiostrepton binding seems to require a proper conformation of the 23S rRNA region under consideration, and protein L11 maintains and stabilizes this structure. The antibiotics binds directly to the rRNA, rather than to the protein. It is likely that the massive molecule of firmly bound thiostrepton mechanically blocks the site of the interaction of the ribosome with EF-G (and EF-Tu). As a result, EF-G cannot interact with the pre-translocation ribosome, and so the catalysis of translocation is not realized. Due to the absence of the interaction, the ribosome-dependent EF-G-catalyzed hydrolysis of GTP, including the uncoupled GTP hydrolysis, is also inhibited by thiostrepton antibiotics. This is a steroid antibiotic (Fig. 12.4) effective against bacterial protein synthesis. The antibiotic affects the interaction between EF-G and the ribosome, but the target of the drug is EF-G, rather than the ribosomal factor-binding site. Accordingly, fusidic acid-resistance mutations are localized in EF-G. Fusidic acid does not prevent the binding of EF-G:GTP with the ribosome and the subsequent GTP hydrolysis. Instead, the antibiotic inhibits the release of EF-G: GDP from the ribosome after GTP hydrolysis. EF-G-catalyzed translocation, or at least its first stage (formation of the translocation intermediate), seems to proceed normally in the presence of fusidic acid. Hence, the inhibition of translation may result mainly from the delay of EF-G:GDP on the factor-binding site of the post-translocation state ribosome: the presence of EF-G blocks the next step of the elongation cycle, namely aminoacyl-tRNA binding. The mechanism of the increased affinity of EF-G:GDP to the ribosome in the presence of fusidic acid is not quite clear. There are two possibilities: either fusidic acid freezes the GTP conformation of EF-G even after GTP hydrolysis, thus resulting in keeping the affinity to the ribosome, or EF-G acquires the GDP conformation but fusidic acid imparts to the protein an additional affinity for the ribosome. The most typical representative of this group of antibiotics is cycloheximide, formerly called actidione (Fig. 12.14). It consists of b-glutarimide ring and cyclic ketone connected by hydroxyethyl bridge. The drug inhibits specifically eukaryotic ribosomes. 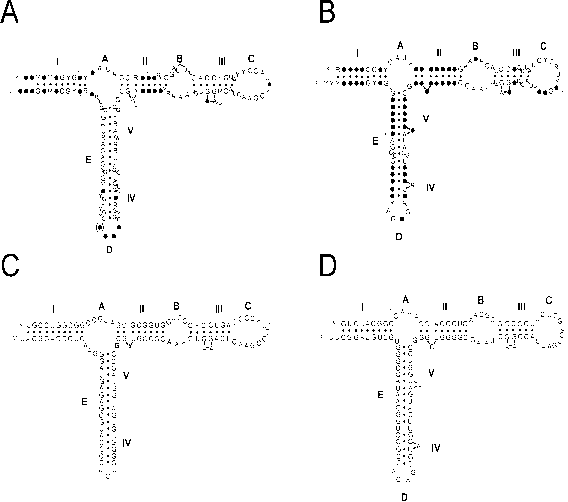 The large (60S) ribosomal subunit has been identified as the target of the antibiotic. Mutations of some proteins of the large subunit of yeast and mammalian ribosomes were reported to be responsible for the resistance against the antibiotic. The drug does not inhibit the peptidyl transferase reaction. Since the drug is known to stabilize eukaryotic polyribosomes and to prevent the release of nascent peptides by puromycin, it is believed to inhibit the translocation step. The mechanism of action is unclear. step. In other words, high Mg2+ freezes the pre-translocation state of the ribosome. Conversely, low Mg2+ stimulates translocation. It is possible that the main factor in these Mg2+ effects is the direct dependence of tRNA binding to the ribosomal tRNA-binding sites on Mg2+: both affinities (binding constants) and kinetics (rate constants) are strongly affected by Mg2+ concentration. Thus a high Mg2+ can simply stick the tRNA residues in the A and P sites and hence prevent their translocation. A low temperature acts in the same way. It is the translocation step of the elongation cycle that responds first and becomes blocked under lowering temperature in a translation system. At low temperature (e.g., +4*C) the ribosomes that elongate are found stopped mostly at the pre-translocation state. The plausible sequence of events that take place during EF2-promoted translocation is schematically given in Fig. 12.15. The first event is the collision of the pre-translocation state ribosome with EF2:GTP. No stable complex between the pre-translocation state ribosome and EF2:GTP or EF2:GMP-PCP, however, has been observed under experimental conditions. Figure 12.15. Sequence of events during translocation. important to indicate that the A site of ribosome in this state seems to be already freed from the tRNA residue of peptidyl-tRNA and instead occupied by domain IV of EF2. The third event in the scheme of Fig. 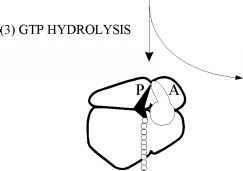 12.15 involves the hydrolysis of GTP. 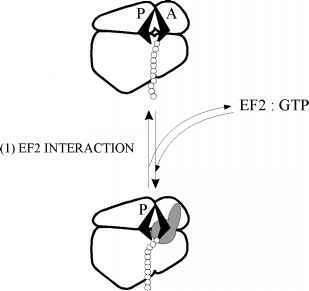 The transition-state ribosome firmly retains EF2 until GTP hydrolysis occurs. If GTP is replaced by a non-hydrolyzable analog, e.g. GMP-PCP, this event does not take place and the intermediate-state ribosome will continue to be in a firm complex with EF2:GMP-PCP. The hydrolysis of GTP and its conversion into GDP as a ligand releases the conformation of EF2, leading to the loss of its strong affinity to the intermediate state ribosome. 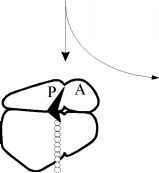 As a result, the intermediate state becomes unblocked and allowed to fall downhill to the post-translocation state. After GTP hydrolysis has taken place, EF2:GDP is found in a weaker complex with the post-translocation ribosome. This complex spontaneously dissociates, i.e. EF2 and GDP are released from the ribosome. This is the fourth event in the scheme. Fusidic acid specifically inhibits just this stage of the process by fixing the complex and preventing the release of EF-G:GDP from the bacterial ribosome. On the whole, the sequence described by the scheme in Fig. 12.15 is strikingly analogous to the sequence of events in EF-Tu-promoted binding of aminoacyl-tRNA (Fig. 10.14): the initial transient interaction is followed by a fast (catalyzed) stage of the main event, which in turn is followed by GTP hydrolysis, and finally by the release of the protein factor together with GDP. Such symmetry of the elongation cycle is seen in Fig. 12.5, where both factor-catalyzed processes are shown as sequences of consecutive events.